Go to any bookstore and you’ll probably find a shelf packed with pregnancy titles – think What To Expect When You’re Expecting, and then some. But another publication is helping expectant mothers and health professionals track a pregnancy’s progress in Tasmania’s north. It’s called The GP Antenatal Shared Care Pregnancy Record. Small, pink and packed with valuable information such as diet guidance, the booklet is given to a woman at her first antenatal visit with her GP and provides a physical record of test results, appointment observations and more. It’s all part of supporting GP antenatal shared care in northern Tasmania – that is, the sharing of the care of a pregnant woman by a GP with either the Launceston General Hospital’s obstetric team (including registered midwife, hospital doctor and specialist obstetrician) or a private specialist obstetrician. 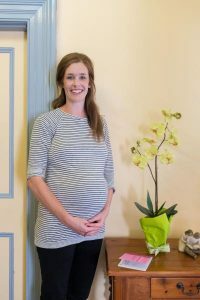 “I’m a bit old school – I have an iPad, but I also like to have a hard copy of things,” Launceston local and second-time mother-to-be Sarah Simms says. Her obstetrician Dr Emily Hooper says a printed resource can be hugely useful if an expectant mum is travelling and needs to seek care at short notice. “With all the information in the book, the person receiving them will know things like what their blood group is, blood pressure (at a glance),” she explains. Find out more about Sarah and The GP Antenatal Shared Care Pregnancy Record in the upcoming edition of Primary Health Matters.